FILE - Men carry humanitarian aid in Mopti, Mali, February 4, 2013. Escalating militia violence and a surge in attacks on aid workers in northern Mali are restricting the delivery of food and healthcare to millions of people, agencies said on Monday. At least 100 peacekeepers have died in recent months, making it the most deadly U.N. mission to date, while the number of attacks on aid workers and their compounds has soared this year. Aid operations have been disrupted about 70 times so far this year - with agencies hit by arrests, assaults, thefts and break-ins - surpassing a total of 68 incidents in 2016, according to the U.N. Office for the Coordination of Humanitarian Affairs (OCHA). "Aid workers are being targeted for cash, radios, cars and other equipment," Ute Kollies, head of OCHA in Mali, told the Thomson Reuters Foundation. "The insecurity is having a growing impact on aid operations ... we are worried about the deterioration." At least 3.7 million people across Mali will need aid this year, up from 2.5 million in 2016, and more than 600,000 urgently need food, according to U.N. data. The rise in attacks on aid agencies has driven some, such as the International Committee of the Red Cross (ICRC) and Medecins Sans Frontieres (MSF), to temporarily suspend operations. The latter was targeted four times in June alone, with their offices and housing looted and one of their staff shot at, according to MSF mission head Juan Carlos Cano. "It is hard for humanitarians to cope with the lawlessness and provide aid in this environment," said Jean-Nicolas Marti, the ICRC's Mali country head, adding that many people were struggling to access healthcare, and that facilities were often low on drug stocks. At least 250 war-wounded patients — including militiamen, soldiers and civilians — have been operated on by ICRC surgical teams so far this year, up from about 150 last year, Marti said. 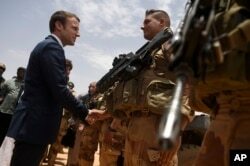 FILE - French President Emmanuel Macron, visits soldiers of Operation Barkhane, France’s largest overseas military operation, in Gao, Northern Mali, May 19, 2017. French troops and U.N. peacekeepers have been battling to stabilize Mali, a former French colony, ever since France intervened in 2013 to push back jihadists and allied Tuareg rebels who took over the country's desert north in 2012. Fighting between rival Tuareg factions has intensified in recent months and threatens to derail a 2015 peace deal meant to end years of conflict and instability in the landlocked country.